The jumbo reserve toilet roll dispenser holds one 300m or 400m roll and a 50m stub roll. The curved line to the right hand side of the dispenser makes it easy for janitors to identify when roll can be removed to the stub roll area. The jumbo reserve dispenser is suitable for high traffic washrooms due to the continuous paper flow eliminating stub roll wastage. 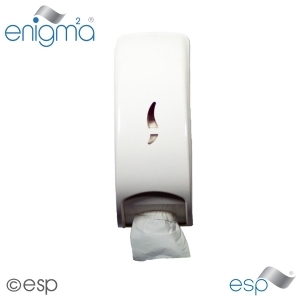 Our standard centrefeed dispenser will deliver up to 300m of paper and gives protection from contamination in busy areas. 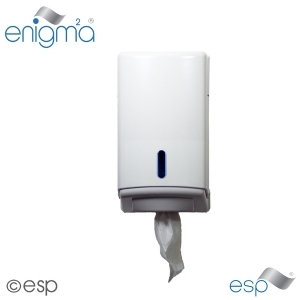 Widely used throughout all industries this is the convenient way to dispense paper when speed and ease of use is desired. 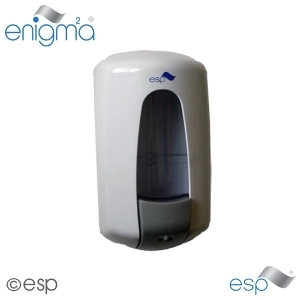 The bulk fill soap dispenser is suitable for a wide range of washroom environments and will dispense a variety of liquid handsoaps available from esp. The pump action on this dispenser helps stop soap wastage and leeking. 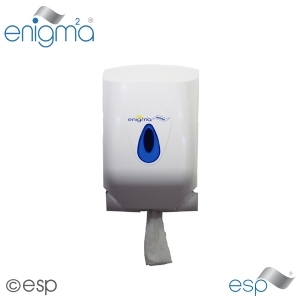 The enigma bulk pack dispenser is designed to dispense high volumes of bulk pack toilet tissue supplied by esp. The bulk pack dispenser has a window at the front of the dispenser to show when product is running low and needs topping up. The bulk pack dispenser is ideal for small cubicles due to it compact design. 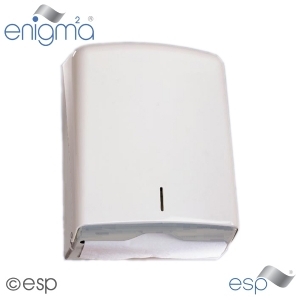 The enigma towel dispenser is of a sleek and stylish design that will fit into any washroom . Unique in design it will work with all formats of standard hand towels. 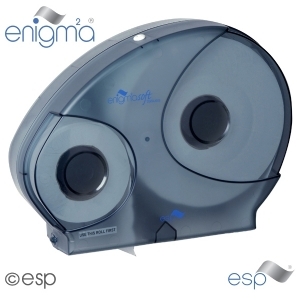 The mini centrefeed dispenser will hold the enigma blue and white mini centrefeed rolls which deliver up to 120m of paper at a time. Compact and clean in design the mini centrfeed dispenser is well suited to washrooms and vending areas where space is at a premium.